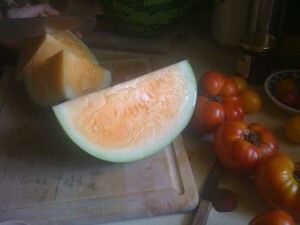 Seedless watermelons grow on triploid (three copies of every chromosome) watermelon plants. Like the banana, triploid watermelons are seedless because it’s impossible to separate three copies of each chromosome into different different reproductive cells. Unlike bananas, seedless watermelons are grown from seed and must be fertilized by fertile (diploid) watermelons to produce fruit. Where do farmers get seeds for a seedless plant? From plant breeders who breed regular diploid (two copies of every chromosome) watermelons together with tetraploid (four copies of every chromosome) watermelons*. The seeds produced by that mating inherit two copies of each chromosome from one parents and only one copy from the other parent. The result is triploid (sterile) seed produced from two fertile parents. A different colored watermelon. Don't know if you can see it, but the surface was an dark purple, almost black color. Those awesome anthocyanin at work again! Watermelons were first domesticated in Southern Africa (estimated to have happened ~4000 years ago), and belongs to the same extended family of plants as cucumbers, squash, and pumpkins. *Tetraploid watermelons themselves were created using colchicine, a chemical produced by several species of crocus that interferes with the proper splitting of chromosomes during plant reproduction, allowing breeders to create artificial tetraploids. In addition to their use is producing seedless fruit, artificial tetraploids are one of the ways breeders have overcoming species barriers since long before genetic engineering. Posted in: agriculture, Crop Profiles, food, Plant breeding, Plants. 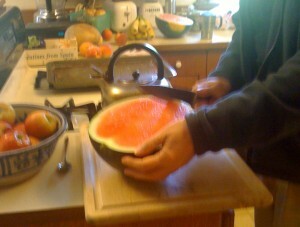 I remember when my late husband grew watermelons most were the red meat, but one year he grew a smaller field of The ones that had the yellow meat and they were very good. I’ve been thinking a lot about them and wondered if you could buy them now a days. We lived in North Fl. And I still live here, not far from the Ga. Border. I remember the melons were a round melon. Would it be possible to buy them where I live or are they grown in another area?